Altronix AL125UL Power supply-Charger - 12/24/VDC at 1AMP with Latching/Non-Latch. 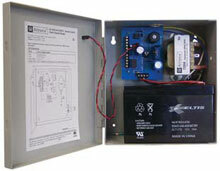 Includes power supply, transformer and enclosure. The AL125UL Power Supply-Charger is a power-limited power supply/charger that will convert 115 VAC 50/60Hz input into two individually PTC-protected 12VDC or 24VDC outputs. It is intended for use in applications requiring UL Listing for Access Control (UL294) and applications requiring an interface with fire alarm control panels. It has a filtered and electronically regulated output. It is a built-in charger for sealed lead acid or gel type batteries. Includes power supply, transformer and enclosure. The Altronix AL125UL is also known as ALT-AL125UL	.